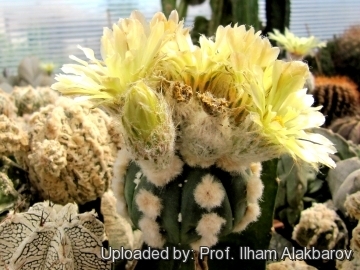 Description: This remarkable cultivars is a Japanese selected strain that combines the big areoles of Astrophytum asterias cv. 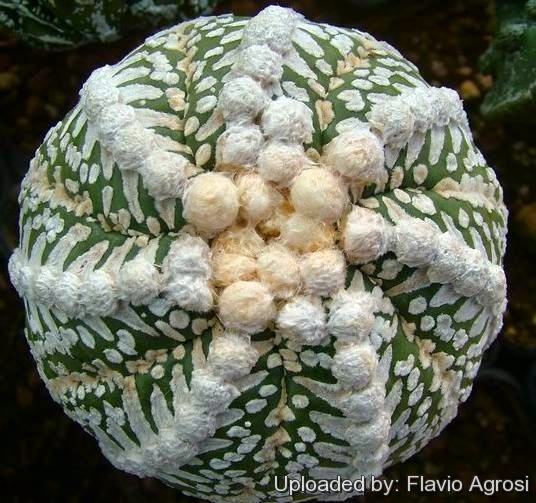 Ooibo Kabuto with the mosaic of extensive white spots of Astrophytum asterias cv. Super Kabuto. It is very variable especially regarding the pattern and density of the spots and plants in the trade are often sold under several names of fantasy like: 'Big Dots', 'Big Areoles', Super Ooibo' and many other. 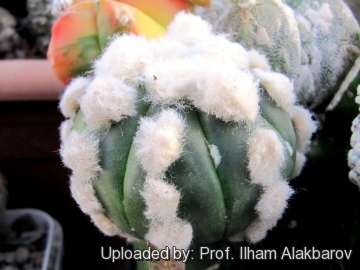 The "Ooibo" has very large characteristic and woolly areoles, the colour of the wool also varies from pure white, to pastel, yellowish, orangish or brownish depending on the clone. So it is easily distinguishable from the common asterias that has relatively small scarcely woolly greys-white areoles. 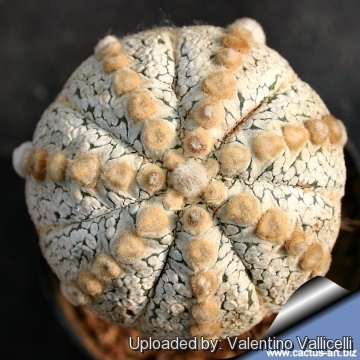 Remarks: The large areoles "trait" of "Ooibo" can appear in combination with other Astrophytum asterias cultivars. i.e. Astrophytum asterias cv. Ooibo + Superkabuto, Astrophytum asterias cv. Ooibo + Rury Kabuto, etc. Cultivation and Propagation: It is not too difficult in a greenhouse, although it grows quite slowly. The plants need a loose well-drained mineral soil. They need a good amount of light. Watering can be done weekly during the summertime, if the weather is sunny enough, with a little fertilizer added. Kept this way, plants will show a healthy, although slow growth. They are frost hardy to -4Â° (-10Â°) CÂ°. Propagation: By seeds, remembering that seedlings dislike strong light and dry conditions, and need to be repotted frequently. But plants are often grafted to accelerate growth, as they would generally take at least five years to reach maturity on their own. However the grafted plants are typically rather tall-growing, in comparison with plants on their own roots, that are usually flatter to the ground.